He staged that escape less than half an hour after arriving at a prison in northern France, and spent six weeks on the run. Nearly 3,000 French police have been drafted into the manhunt, a police source told AFP. "Everything is being done to locate the fugitive," an interior ministry official said. France's Justice Minister Nicole Belloubet, who travelled to the Sud-Francilien prison in Réau on Sunday evening, called it "a spectacular escape". "It was an extremely well-prepared commando unit that may have used drones to survey the area beforehand," she said. The prison courtyard where the helicopter landed was the only area not protected by anti-aircraft netting. Prison union representative Martial Delabroye said that was because inmates do not use it, "except to leave the prison". Nobody was injured during the jailbreak, which happened at around 11:20 (09:20 GMT) on Sunday. The captured pilot was released, and later taken to hospital suffering from shock. Faid's accomplices had taken the flying instructor hostage at a small flying club in Fontenay-Trésigny, where he was waiting for a student, and ordered him to fly to the prison. Faid initially got out of the helicopter and into a black Renault Megane which was seen heading for the A1 motorway. That getaway car was later found burnt out at a shopping centre car park in Aulnay-sous-Bois, a Paris suburb. Early on Sunday afternoon, the fugitive was said to have swapped to a white van. Born in 1972, Faid grew up in a notoriously rough part of Paris. In the 1990s, he ran a gang involved in armed robbery and extortion in the French capital. He has said his lifestyle was inspired by Hollywood gangster films, including the Al Pacino thriller Scarface. He is devoted to US director Michael Mann's stylised crime thrillers, especially 1995 gangster film Heat. He once approached Mann at a Paris film festival and told him: "You were my technical adviser." Faid claimed to have watched the film dozens of times to hone his skills as a bank robber. In 2009, Faid wrote a book about his experiences of growing up in Paris's crime-ridden suburbs and graduating into a life of law-breaking. He claimed to have turned his back on criminality, but a year later was involved in the failed robbery which earned him a prison stretch in Réau, in the Seine-et-Marne region. French police have nicknamed the gangster "L'Écrivain" - "the writer" - in a nod to his autobiography and subsequent media tour. One of Faid's most recent prison supervisors said he was never in conflict with guards, but that "we must always be wary". Faid's cycle of imprisonment and escape began with his arrest in 1998 on multiple counts of armed robbery and bank theft. In 2009 he was freed on parole, swearing that he was a changed man - but by 2011, he had breached his terms of release and was back behind bars. 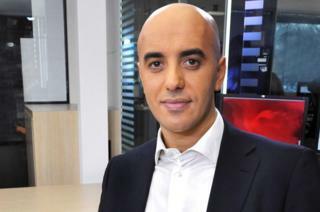 In 2017, Faid was sentenced to 10 years' imprisonment for his 2013 jailbreak from Séquedin prison, outside Lille. He was also given 18 years for masterminding a 2010 robbery in which a young policewoman, Aurélie Fouquet, was killed. Faid mounted a failed appeal, and in April 2018 was given a heavier sentence of 25 years for the botched robbery. He was serving that term at the time of his latest escape. The fugitive is not the first to escape a French jail by helicopter. In 2001, three armed robbers fled a prison in Draguignan, southern France, after an accomplice hijacked a helicopter from an airfield in nearby St Tropez. Two years later, inmates accused of running an international drugs ring escaped a remand centre near Aix-en-Provence by similar means.